After your victory against the desire of your party one would have expected you to show some hand of conciliation towards the party by accepting the list of principal officers sent by the party? Let me take the first question where you say that my emergence was not the party’s position. We have it on record that at no time did the party say it has zoned this position to a particular zone. Soon after the election, the Party held a meeting at the caucus level. At the caucus level, there was a working document that the Party presented, which showed that it has zoned the Senate Presidency to North Central but at the meeting, it was rejected and thus, the Party needed to go back and work on the paper. We waited for the Party but there was no follow up. Then, we started hearing rumour that the party was thinking that it might consider not holding on to that proposal from the National Working Committee that the Senate Presidency should be zoned to the North Central and may be, it will be given to the North East. Then, the governors got involved, held their own meeting and also recommended North Central. All we were waiting for was for the party to announce that the position has been zoned to North Central but all of a sudden, the leaders of the party categorically came and said there was no zoning. If the party had said it has zoned this position to the North East, Abubakar Bukola Saraki would not have contested. Why did you not read the letter from the South West Caucus? Because I have not received their letter but they communicated to me later that day that their letter should be ready by the end of the business last Friday. I do not know whether they would have submitted it. I did not want to do anything that was not strictly official. I knew that they had no objection to a particular candidate but I wanted to be sure I got a letter from their caucus like others did and that was the reason I did not announce any name. Their letter has not arrived but they have conveyed to me that they have got nine or 10 signatures and are waiting for two or three remaining to sign but some of them were not around and that was the reason their letter was delayed. The impression is that you do not want to concede anything to your rivals and it is that the winner takes it all. If you check, you will find out that I made a plea. There was only one particular zone that had issue and that was North East zone. In the other zones, there was a general consensus on the direction they were going. But in a scenario where you have over 75 per cent of the Senators holding on to a very strong position, it makes things very difficult and I appealed to them to review it. I also had the opportunity to sit with Senator Ahmed Lawan as part of my reconciliation efforts. Although some of the good news that have come out of the reconciliation is not in the public domain or reported because I am confident that this matter will fizzle out and blow away because we are making effort to begin to engage ourselves because these are two groups that never had problems. I did say to Lawan when we sat down to talk that he should try and reach out to his members in the North East so that they can come together to begin to engage themselves. The idea is that beyond the issue of leadership, they must work together as a caucus because there will be many issues that would be sent to the caucuses to go and discuss and there must be unity there. I must say that on Lawan’s own part too, I could see that efforts are being made. I want you also to understand that it is just two weeks after election. It is normal that after election for this kind of position that was fiercely contested for, there would be sentiments and emotions. If you can remember, after Presidential primaries, for weeks, there were people today who are now pretending to love President Buhari more than us, they did not attend rallies. They sat in their houses and we were begging them. What I am saying is that two weeks to me is short in a healing process and I am sure that if you look at the mood the first day we resumed and the mood today, you will see that peace will come. As someone who has taken this position, I will not stop until I see a full healing process, a full reconciliation. I am a fair minded person and I will be fair to everybody because everybody has contributed for us to get here. Things have happened unfortunately but it cannot be a winner takes all. Everybody must be part of that process and we will get there. We are not entirely there but I believe that in the few weeks within this period of recess, by the time we come back, we would be able to get closer and closer as a united APC family. I am sure that by the time we come back with full leadership in place, we will be better off than where we are now and that responsibility is mine. I will prefer my actions to speak more than what I say. Just come back in two months time, I am confident that this will be a thing of the past. We will unite because we are all responsible and we know the issue before us are greater than this. Even in states where people contest for elections and lose out, it takes time for full reconciliation to take place and I believe we will get there in ensuring there is full reconciliation. Since your emergence, have you met with President Buhari, Senator Bola Tinubu? What did they tell you? First, it has been the view of some of us Senators that what Mr. President wants to see as a father is a reconciliation among us as a group and his position is that he will like us to unite so that he is not seen to be on one side or the other. I think those steps are going on. As regards Asiwaju Tinubu, as you know, he is one of the leaders of the party and I have great respect for him. Two of us have worked very closely together on major issues at different stages in the development of our party. Unfortunately, in this matter, as much as one wants to win a support of all forces within, it happened like that and I think at the end of the day, we will look at the things we have done together that have gone well. Yes, it is a setback but I do not think that that in any way was what will dictate the kind of relationship that we have. We are both responsible and committed to the project of the party and Nigeria. We will overcome this and move forward. It is our intention, as part of the healing process to be able to do that and it will happen. Nomination of Ministers and Mr. President’s position to select them against party’s plea to be carried along. What is your view? We have elected Mr. President as a leader of the party. I believe he will find his candidates he believes are fit and good for the offices. I am sure in most cases too, it will be with the consultation with party leaders. There cannot be rigid position. There will be a hybrid. There would be the candidates that he wants and also, in taking those decision, you know that it is not possible for one man to know the entire 36 states. He might have a good knowledge of people in certain states but in some states too, I am sure he will ask people about candidates he wants to appoint as ministers. What is key is for us to have a right team that will support him because he is heading that team and at the end of the day, he can be happy with who he works with. So, we can say that the prerogative in that process would be his. The process of getting there is ongoing. 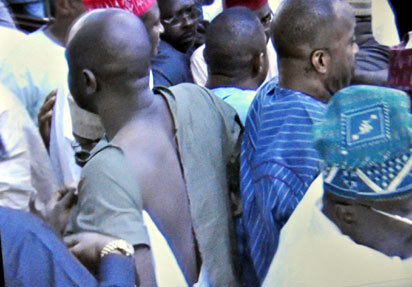 What is your reaction to the brawl on the floor of the House of Representatives last Thursday? Honestly, it was unfortunate but if we have taken certain necessary steps, I do not think these will happen. We must respect the wishes of the members of the National Assembly. Yes, as part of the party, you must work with them but working with them is different from directing the senators and there must be a kind of dialogue because the rules in both the Senate and the House of Reps are very clear. At the end of the day, party’s role must be seen as guideline or advisory. It must be seen as advisory, not as something that must and shall be implemented. I believe that what we saw in the House of Reps was a fallout of that and that is what I will appeal for, that members of the House sit down together among themselves, not with outside forces. I am sure they will resolve all the issues and get down to business. As I said, it is not the best but I am hopeful that everything will be alright. This is just two weeks after the election that is due to no fault of anybody, there were events that happened that created a lot of controversies here and there. I believe that within a few weeks, these matters would be resolved and those of us in our party will unite. We have no alternative but to unite and I am confident that the Speaker also feels very strongly that we would be fair to all, try and unite with everybody and move on. I just want to appeal to the media and the public to give us some time to do that. If you read some of the publications, you will find that majority of the legislators are not the ones pushing these disunity issues. They should leave us in the National Assembly. Among ourselves, we will find a solution and we will move forward because at the end of the day, once the Ministerial list comes, everybody will leave Senate and be reporting about ministers and appointments. It is we people that have to go and work with ourselves. We should be left to find a course that will enable us to do it. People are asking if we are actually serious but I believe it will come to pass.